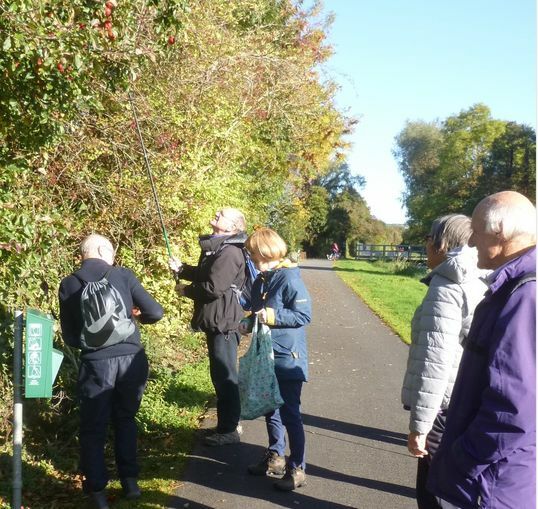 Eleven of the Columbanus Walkers met in Bangor, in early October, under grey skies to take a walk along part of the Newry Canal on what turned out to be a glorious, sunny autumn day. Arriving at Scarva, Peter told us about the geography and history of the area between Portadown and Newry. Many centuries ago, this wet land was covered with a dense forest that could only be crossed by three causeways, or “passes”. These were at modern–day Scarva, Poyntzpass and Jerrettspass. Construction of the Newry Canal, which was the first canal in these islands to rise to a summit (between Scarva to Poynztspass), was opened in 1742 to transport coal from the coalfields of county Tyrone to the national capital in Dublin. Over time, the canal fell into disuse, principally because of the Belfast to Dublin railway line that was built alongside it. 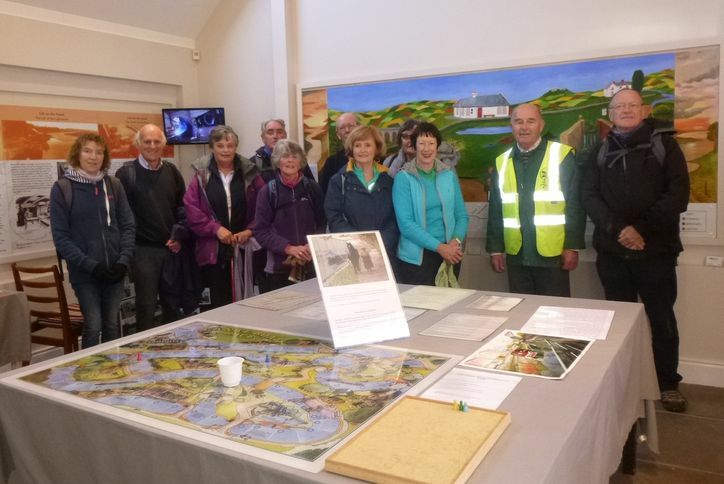 Later we visited the interpretive centre run by the volunteers of the Inland Waterways Association of Ireland. George Beattie, one of the volunteers, told us about the work that has been going on for many years to restore the canal for recreational use. We walked to Poyntzpass where we had lunch beside the canal before exploring the village. The vilage was built in the early 1800s by descendants of Lieutenant Willam Poyntz, who had led the defence of the “pass” in that area against the more numerous troops of the O’Neills of county Tyrone. As a result, in 1609, Poyntz was granted of 500 acres of land in the area. His son, Sir Toby Poyntz, later built the hamlet of Acton, named after the Poyntz’s home in Gloucestershire. From the towpath we admired the fine Acton House, built in the late 1700s. Since the 1930s, Acton House has been the home of the Best family which now includes the Irish rugby captain, Rory Best, and his brother Simon. As we travelled along the towpath between Scrava and Poyntzpass we were able to pick some delicious county Armagh apples and we admired the procession along the canal of a pair of swans and no fewer than seven of their brood in their adolescent grey feathers. After returning to our cars at Scarva, most of us stopped off at a large shopping complex near Lisburn for some refreshments and window shopping.